Are you using all features ScootPad has to offer? In this post, let’s explore how the new NAVIGATOR feature can help you leverage ScootPad to its fullest. 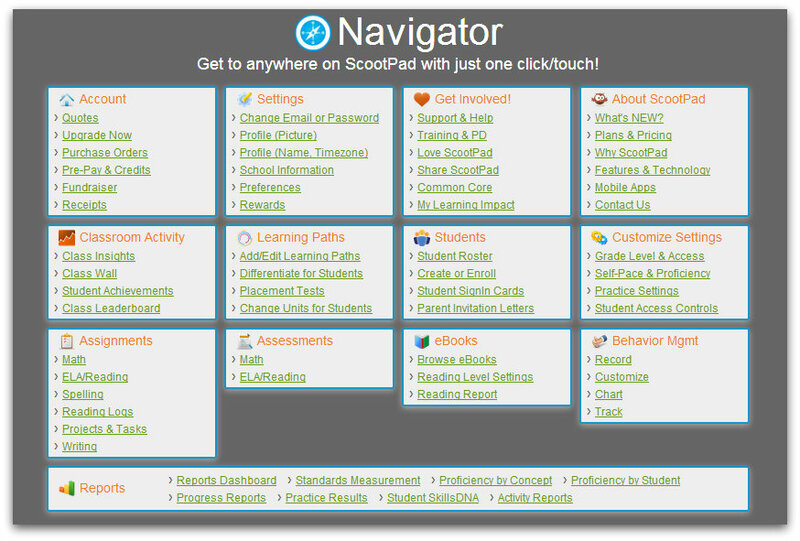 The Navigator gets you anywhere on ScootPad with just one click/touch. It’s a comprehensive view of all features and options available on ScootPad. Simply click on any link to be taken right to that very page/feature. Get to all your account settings and support/help features. Select a classroom (teachers) or student (parents) to navigate all the classroom management, student learning and reporting features.